At the request of WOW Tours, a TPB was sent, at no cost to me, for my honest opinion. 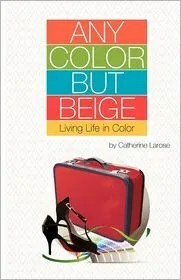 Synopsis (from back of book): After years of living a beige existence, Cat Larose, international color marketing expert, finally added a little color to her own life. All it took was a Paris sunset and a little red suitcase. Everyone wanted Cat’s life. She had a handsome husband, a stylish home and a fascinating career as an international color marketing consultant. Work took Cat to some of the world’s most beautiful cities but something was missing: ironically, it was color. One day she found herself in Paris watching a sunset and, in a moment of clarity, she caught a glimpse of her sepia-toned future. When Cat got home, she did what she’d longed to do for years. She decided to paint her bedroom a magnificent Bordeaux red and put an end to her beige existence and her marriage. That was the beginning of a new life. Any Color but Beige is a bright, funny, genuine account of one woman’s search for love in the deep end of the dating pool. None of the self-help books prepared Cat for the often funny, occasionally puzzling, sometimes sad but always colorful dating adventures with an international cast of frogs, princes and players. Cat makes the classic female mistake of thinking that love is a life preserver. Until one day she learns to swim. My Thoughts and Opinion: This was a debut novel by this author so I had no preconceived thoughts as to what type of writing style, talent, interest, character relatability I was in store for. I accepted the request for a book review solely on the synopsis and premise of the book, written as a memoir, and as the synopsis states, also a “bright and funny” account of the author’s life. I was pleasantly surprised once I started reading the book and as I continued. The writing was fluid and flowed as she travels from country to country, and passes through phases of her life. There were some personal issues that I could relate to, even though, there was approximately a decade of an age difference between the author and myself. However, and not wanting to disclose spoilers and/or nor do I consider myself a prude, the years after her divorce and once again in the “dating arena” her experiences during that time seemed to be a bit much. The underlying moral of the story, though, is true of any woman of any age and whatever stage of one’s life. in exchange for my honest review. or given to family and/or friends.